Heating and Cooling: Why is My Air Conditioner Not Turning On? 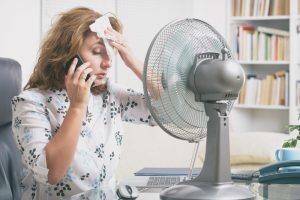 When you live in a hot and humid climate, you know just how important it is to have a fully-functioning air conditioner at all times. In fact, when your air conditioner is running smoothly, you probably don’t even notice it. When it won’t turn on, however, there might be a moment of panic as you wonder just how hot your home will get before the AC comes back on. At Frontier A/C Heating & Refrigeration, we understand how important it is to our clients to receive timely repairs in these situations. Continue reading to learn some of the troubleshooting tips you can perform on your own, and then call us in Mission when you need more in-depth repairs for your heating and cooling system. While power surges happen all the time, most are too small to even be noticed by the average homeowner. Every now and then, however, the lights may flicker or even shut off completely. When this type of situation happens, you will need to check the circuit breaker box in your home. If your air conditioner unit will not turn on, it is highly likely that a circuit was tripped during the power surge or power outage. Circuit breakers are designed to shut off when they receive an overload of electricity. This is a good thing, because it protects you and your home from electrical fires. Resetting a breaker is not complicated — simply flip the switch to the off position, and then return it to the on position. If this does not fix the problem, be sure to call Frontier A/C Heating & Refrigeration. If your air conditioner won’t turn on, or it turns on but doesn’t cool properly, it could be due to a clogged air filter. It’s easy to forget to replace your air filter when your AC unit is running smoothly. Filters should be changed approximately every three months, but a lot can happen during that time that causes you to lose track of just how long it was since you last replaced it. One tip that might help you to remember is to set a recurring reminder on your phone or another device. Another option is to buy one of the more expensive filters that are now available with smart technology. Once you purchase this type of filter, there is an app for you to download to your phone. After you have installed the app on your phone, the filter will actually notify you when it is time for a new one! Refrigerant is a coolant that is used in a heating and cooling unit to cool the air passing through the system. Unlike the coolant in a car, it does not have to be added regularly if the unit is working properly. If there is a refrigerant leak somewhere, however, your AC will not be able to properly function, which could cause it to shut down. A risk that is associated with this type of leak is refrigerant poisoning, so it is very important to make sure that you call an HVAC professional to perform this type of repair. At Frontier A/C Heating & Refrigeration in Mission, we work hard to provide our clients with the professional service they deserve. We believe that our policy of transparency is the best business policy to have and we hope you do too. If you are having problems with your heating and cooling system, don’t hesitate to contact us today!